Eric Dresbach, of W.D. Farms. CIRCLEVILLE, Ohio — There are many words that describe the product Eric Dresbach and his crew apply to fields. Depending on whether it came from a livestock barn or a city, it might be called manure, or biosolids. It might also be called fertilizer, nutrients, or a few words inappropriate to print. Dresbach sees manure and municipal byproducts as organic resources that are good for the soil and for crop production. His view is supported by state and federal regulatory agencies, which promote the use of manure and biosolids as valuable sources of organic fertilizer when properly handled and applied. 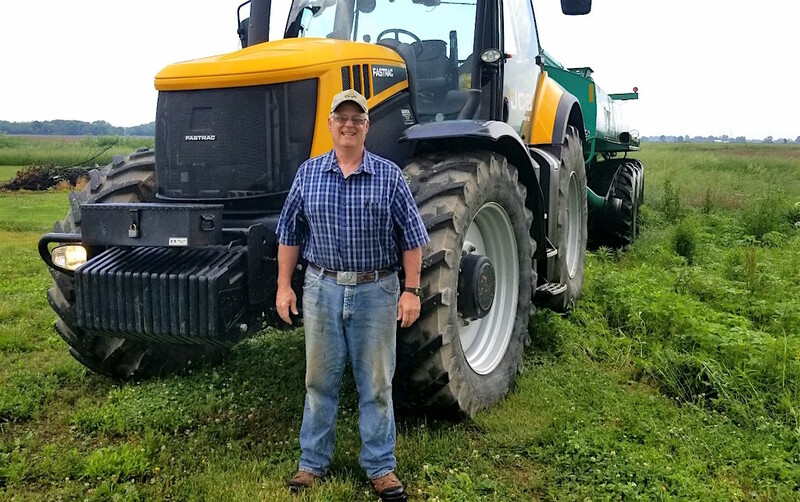 Dresbach has been custom applying manure since 1987, and he’s serious about trying to do things right. Eric grew up on his family’s farm in Pickaway County and earned an associate’s degree in agronomy from Ohio State University’s Agricultural Technical Institute. He began his own trucking company in 1985 and he’s been hauling and applying manure since 1987. He holds state permits to apply manure in Ohio and Indiana, including a Certified Livestock Manager permit from the Ohio Department of Agriculture. He also requires most of his employees to complete the same training, even though the law does not. Eric is president of a family-owned custom applicator business called W.D. Farms, an old business name that today stands for “with daughter.” Eric and his daughter, Megan, operate the company, along with mechanical help from his son, David, who also runs a diesel repair shop. The family, along with a crew of five to 10 employees, haul nutrients in a region that stretches from Hillsboro to Circleville, and Defiance to Richmond, Indiana. Depending on the year and the customer base, the Dresbachs can find themselves going even further. They serve 15-20 customers a year, many who are repeat customers. About 80 percent of what they apply is livestock manure, and the rest ranges from biosolids to paper mill byproducts, and even leftover lime from drinking water plants. Megan Dresbach said she really doesn’t have a preference on what they haul, as long as the day is going well. “If product is moving out the door, we’re making money,” she said. Although land application is limited primarily to the spring and fall, when the weather is fit, the business is year-round. The Dresbachs service their own equipment as much as possible, and they plan their application days around the weather, and farmers’ needs. 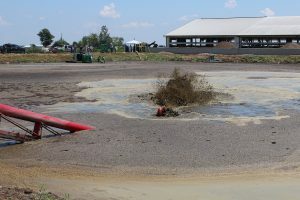 The big thing is making sure manure lagoons get emptied often enough to avoid becoming full, and making sure there is enough time to map out the different fields where the nutrients must go. Eric said they often refer to the livestock farms as the “generators” of nutrients, and equally important are the crop farms, where the nutrients are applied. The Dresbachs have their own trucks and contract additional trucks and trailers as needed, and they incorporate nutrients into the soil as much as possible. As Eric puts it, “there are a lot of tentacles to the octopus,” and it takes a practical understanding by the farmers and the manure applicator to make the experience go well. As an applicator, he needs to know that he can get his equipment in and out of the farmer’s drive, and he needs to know what the soil samples show and the rates that are to be applied to each field. Eric relies on a one-page bid sheet that lays out the parameters of what is expected. Most of the livestock farms he services get their manure hauled twice a year, but it all depends on the size and scope of the operation, and what is needed. In addition to satisfying farmers, custom manure applicators like the Dresbachs also find themselves with the challenge of satisfying neighbors and non-farmers, who may have concerns about the process. Megan said her goal is to try and understand people’s concerns, and explain what is being done and why. Manure agitation demonstration at an educational event. Eric is president of the Midwest Professional Nutrient Applicators Association, a trade group he helped start 10 years ago. The association co-sponsored the 2016 North American Manure Expo in Ohio, and Eric has given educational presentations at other events, as well. “I think Eric is probably one of the most professional of the manure haulers we have in the state of Ohio,” said Glen Arnold, manure nutrient specialist with Ohio State University. Arnold said the Dresbachs have partnered to conduct test plots, and are the kind of company that is constantly looking for ways to improve their operation. Eric received the Friend of Extension award at OSU Extension’s annual banquet this past winter in Columbus. Although the Dresbachs have been successful, they’ve also experienced a lot of challenges — namely the weather and keeping good help. Every year presents a new weather challenge, and some years they can work only half of the days they would like, they said. Another challenge is labor, and bringing in enough revenue to pay a competitive wage. Eric said his labor costs have gone up significantly in the past couple years, due to competition from non-agricultural jobs. The biggest challenge, arguably, is applying manure in an environmentally and socially acceptable way. Eric said the industry is doing a much better job of incorporating manure during application, and growing cover crops to keep nutrients in place. 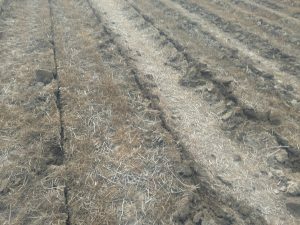 Having a broader crop rotation — with more than just corn and soybeans — provides a bigger window to spread manure throughout the year, he said. Even though being a custom manure hauler can be challenging — and even a bit messy — it’s an essential part of animal agriculture, and one that the Dresbachs enjoy. When so called farmer broadcast biosolids on his field he instantly becomes a sucker for the sewage industries, State and US EPA’s propaganda which insists this contamination is safe, that being a load of sewage in itself. It is miles from being free from risk which is the normal definition of safe. It should be noted farmers and the sewage industry makes a lot of money contaminating this way to the peril of the public consumers and water resources. Make no mistake they are contaminated. **So when you hear anyone from the multi-billion dollar sewage industry or anyone with monetary ties to any part of the sewage industry say the chemicals (in-organic) in biosolids are minimal and inconsequential or that they support composting with biosolids, ask them for any test showing the degree of hazard and concentrations of 85,000 chemicals that are found in biosolids or a composted biosolids like Milorganite from Milwaukee or now your town.